Lebanon's missing: Will there ever be closure? Imm Ayman has found it hard to sleep for 36 years. During the day, chores keep her busy and she is distracted from thinking about her son's whereabouts. At night, she stays up for as long as she can, keeping an eye on the door, just in case Ayman returns. She likes being in the kitchen when she misses Ayman, thats where they spent most of their time while he was still home. She recounts how as she was peeling an orange, she heard him call out — Mom, I am here. I am back. Had he returned? She leapt forward to embrace her son, the orange and the knife slipping from her hands. Slowly she realized it was all in her head. 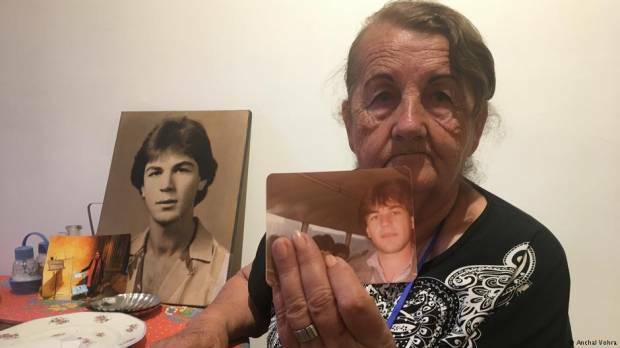 In reality, he has never returned, not since 1982, the year he was abducted, at the peak of Lebanon's civil war. "It was June 28, a Monday morning, he was on his way to work when he was picked up," says Imm Ayman, holding on to a photo album full of Ayman's photos. 22 at the time, he worked at a prominent bank, helped his constrained mother and showed plenty of promise. But that's when his young life was disrupted. Ayman became one of the thousands of fathers, husbands and sons who were kidnapped and disappeared during the 15-year-long civil war in Lebanon.The government puts the figure of those who disappeared or are missing at 17,000 but has done little to nothing in finding out what happened to them and where they are. "I like to believe he is still alive," Imm Ayman told DW, peering into the photograph of a young man with a soft face. "Maybe he is detained somewhere," she added, tears forming in her eyes. For Imm Ayman, there is hope, until there isn't, until there is closure. Lebanon's government has been reluctant to move on the issue and provide closure but in a renewed push activists are asking parliamentarians to vote on a draft law on the missing. It has already been cleared by two parliamentary committees and now awaits legislative approval. DW met Imm Ayman at an exhibition organized by the International Committee of the Red Cross (ICRC), that depicts the stories of the missing through art. The ICRC has also been collecting testimonies of the families of the disappeared for the last six years. Since 2015, they have also been storing saliva swabs of the family members, to ascertain the DNA of the missing and match it as and when their remains are found. "We are doing this work so the parliament can vote on the law on the missing and initiate the mechanism. This mechanism won't [have to] start from scratch and will have our data," Yara Khweja of the ICRC told DW. Dalia Khamissy, a photographer who lived in the country through the years of the civil war, has been documenting the stories of the missing for over eight years. Her body of work is expansive. But one of her photographs perhaps best captures the pain and longing of aging, ailing mothers. It shows Imm Aziz sitting under the framed photos of her four sons who were abducted from home while the family was still eating breakfast. Imm Aziz has kept their clothes, their books, even the school bag of her 13-year-old son. "Imm Aziz said to me that she doesn't think her sons are alive but she demands to know their fate? Where are they?" Dalia told DW. "Until you bury your loved ones, there can't be closure." The thousands of missing are perhaps buried in plain sight. According to researchers, there are over 100 mass graves across Lebanon, in public places and land plots. A Lebanese NGO, Act for the disappeared, has collated a database with information on 112 such locations. A government commission has so far merely acknowledged three sites. The NGO is wary of sharing the locations of the mass graves because it fears they may be destroyed. "Some graves have already been destroyed mainly because of construction," Justine Di Mayo, co-founder of the NGO, told DW. But there seems to be an additional fear among the activists working on the missing and the mass graves. They worry that the process of getting the law passed and finding the missing may be jeopardized if fingers are pointed at the suspected perpetrators. They say the goal is to find the remains of the missing and hand them over to the families to provide closure, and not get involved in a judicial process or seek justice. Some of those alleged perpetrators were pardoned and some of the militia leaders are today's leading politicians. The activists want to publicize the search as a humanitarian issue and worry that digging any deeper could upset the fragile political balance that communities in Lebanon have struggled to maintain since the end of the civil war. The apprehension is shared by the families. Imm Ayman, for instance, doesn't want to talk about who kidnapped her son. It could be some one she knew, even a neighbor. "What can I ask the lawmakers? The whole country is in shambles. I hope that one day they will tell me where my son is."